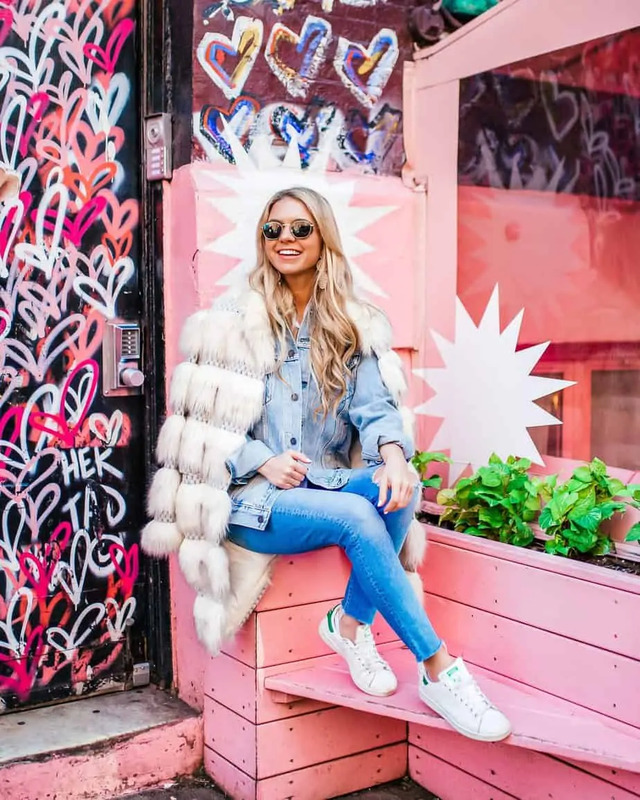 No one knows about New York City’s most Instagrammable spots better than a professional Instagrammer…who also happens to live here. (Me!) 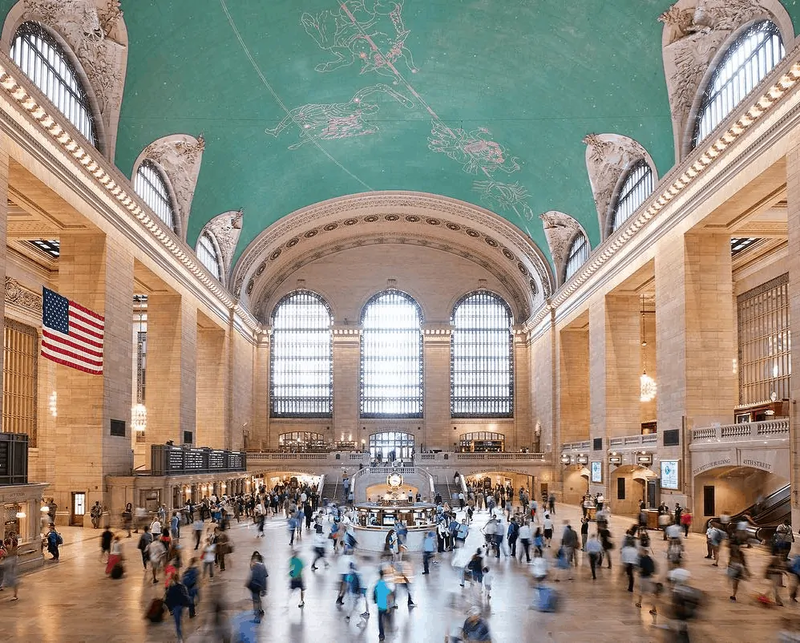 Below, you’ll find a list of the best places for street photography in NYC, the best places for indoor photos, a handful of hidden gems, and NYC Instagram spots that’ll make you the envy of your followers. This is by no means a comprehensive list, but it’s a few “must-visit” locations for a first timer. 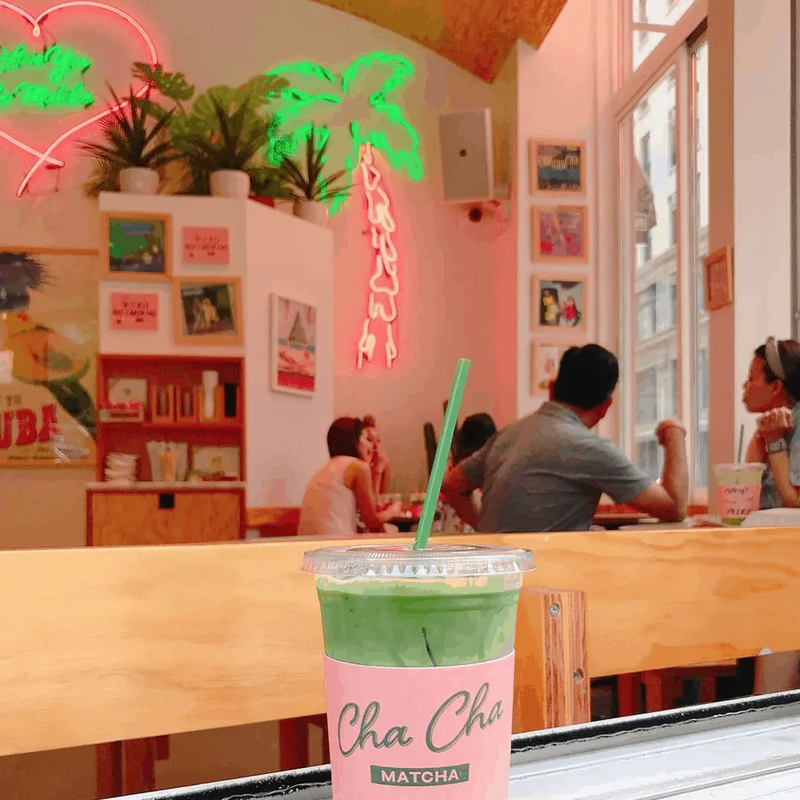 Even if you’re not a fan of matcha, you’re going to want to check this place out immediately—but prepare to wait (there’s almost always a line.) Beyond matcha lattes, they also have fab matcha ice cream. The healthy Italian restaurant describes itself as a “unique pink jewel box in the heart of Nolita” – which it definitely is. They don’t take reservations, unfortunately, and there’s always a wait…but I’d recommend taking a photo on the super cute pink bench outside of the restaurant. A New York City institution. You can’t be in the city without getting a shot of the triangular 22-story, 285-foot building. To get the best angle, go closer to 23rd street on the sliver of sidewalk area. 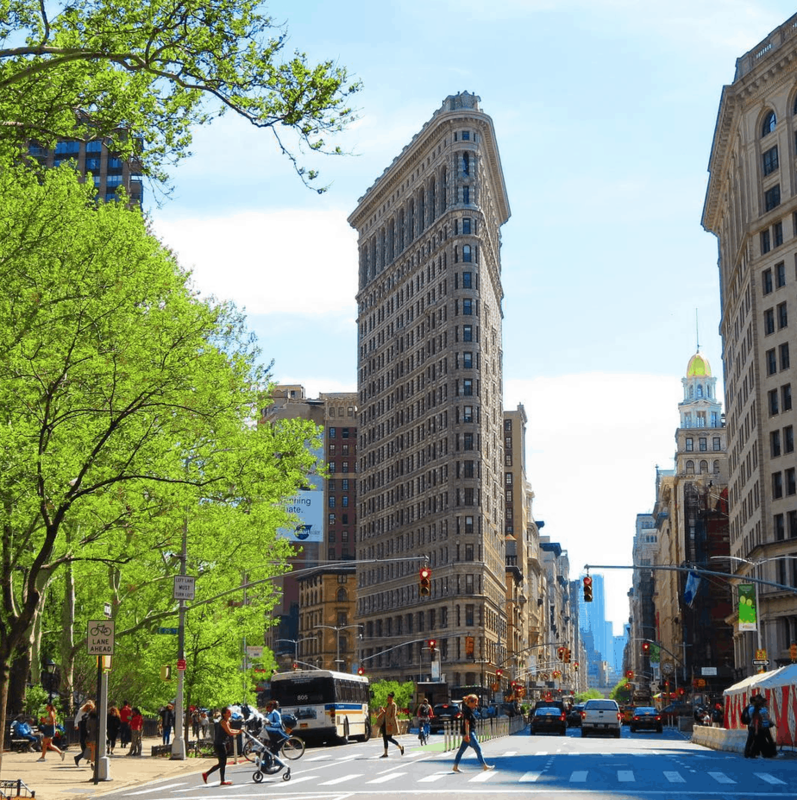 Quickly becoming one of Brooklyn’s hottest neighborhoods. 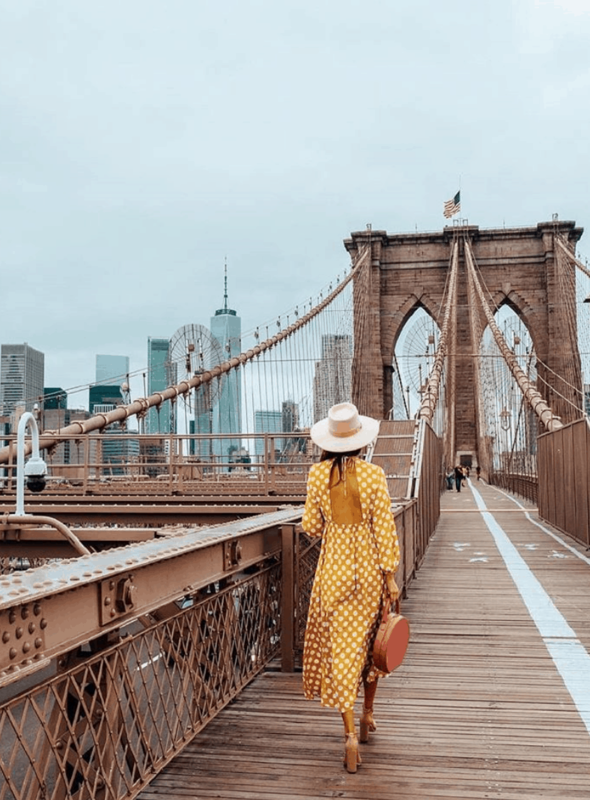 To get the perfect shot, stand at the intersection of Water Street and Washington Street in Dumbo—you’ll notice the two buildings perfectly frame the Manhattan Bridge. Then, head to Cecconi’s for dinner and drinks right under the bridge. Such a chic spot. Also not far: 1 Hotel Brooklyn Bridge. They have a great rooftop bar for drinks, and one of my favorite lobbies of all time. Visiting the “top of the rock” (aka the top of Rockefeller Center) requires tickets, but for a photo like this, it’s worth it. When Barney’s opened a second location downtown, everyone was thrilled—and it was about more than just the clothes. 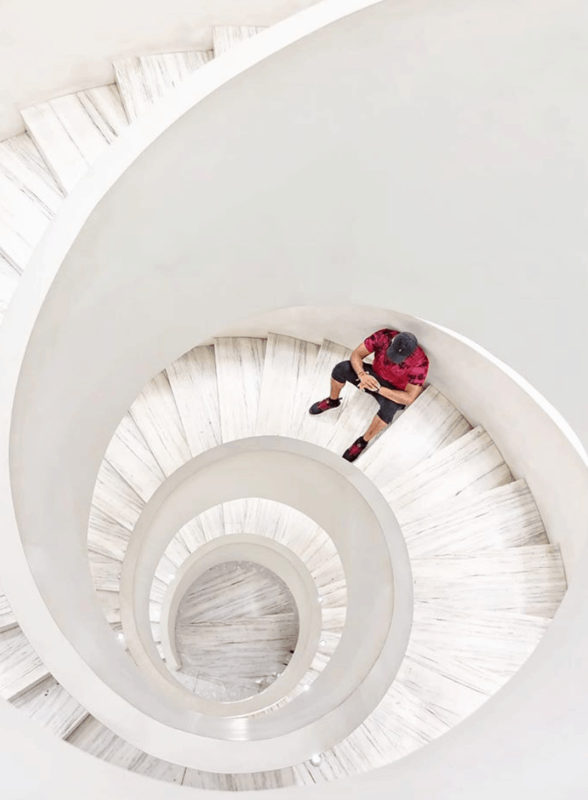 This gorgeous spiral staircase starting showing up on everyone’s Instagram feeds. Looking for more travel secrets? Check out my post about How I Use Credit Card Points to Travel for Free. If you’ve never been to New York, I can’t recommend the 1WTC Observatory enough. I live here, and I was still blown away by the views and the experience. The building has a three-story “observation deck” that’s located on floors 100–102—so, if you have a fear of heights…you might want to think twice. The hotel is a true New York icon—and so is its awning. Pop in to the King Cole Bar for a Bloody Mary, which is where the cocktail was first invented. There is arguably nothing better than walking along the Brooklyn Bridge on a gorgeous sunny day. I mean, I’ll be honest — I haven’t done it in years — but I remember it being really lovely. Have you seen how beautiful these photos are? Just a warning…the bridge gets insanely busy during the summer (and I mean bumper-to-bumper foot traffic) so if you want a shot like this, you probably won’t get it midday. The Brooklyn Bridge Pedestrian Walkway begins at the intersection of Tillary Street & Boerum Place. Would you believe me if I told you this was a subway station? It’s also flanked by some pretty amazing stores on either side (check out Sugarfina for more Instagram candy.) This place is so symmetrically stunning, it’s nearly impossible not to take a great photo. Hyperlapse or fast-motion videos also work really well here, particularly on the second level overlooking the chaos below. 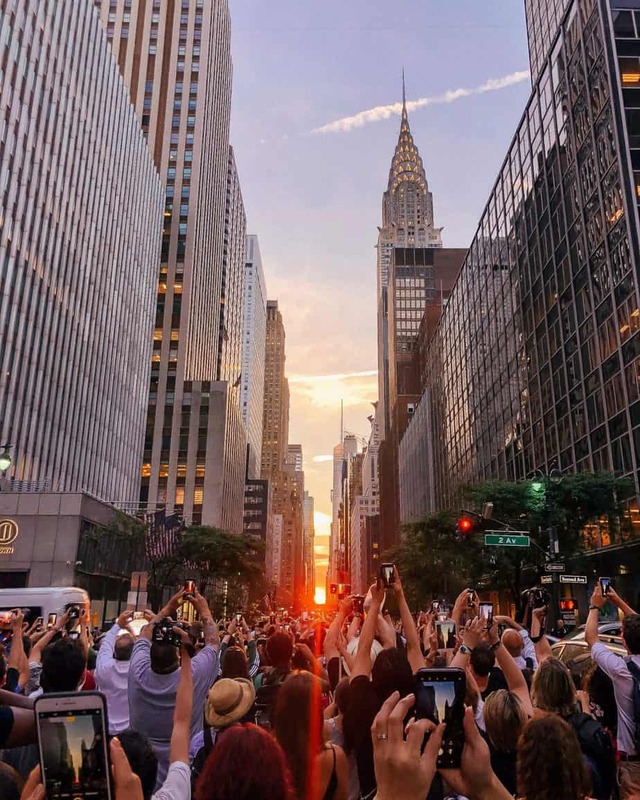 The just-opened structure—inside of Hudson Yards, a fancy development on the West side of Manhattan—has become New York City’s most instagrammable new addition in years. So what is it, exactly? The Vessel is a public art installation that soars 15-stories high, consisting of stairwells and 80 viewing platforms. If you’re ambitious, climb to the top for an out-of-this-world vantage point of the city. When the New York City-based interior design firm Roman and Williams decided to open a restaurant-slash-home goods store in Soho last year, the design world lost their minds. Inside, you can indulge in a quintessentially French meal at Le Mercerie (the cafè) or peruse fancy home decor at the Guild. Needless to say, the photo opps are endless. Need a little inspo? Check out this stunning shot by my friend @AGuyNamedPatrick. I used to say that if I hadn’t done a destination wedding in Mexico (after getting legally hitched at City Hall first) I would have wanted to get married at NOMO Soho. This uber-chic hotel and its equally chic outdoor restaurant are what Instagram dreams are made of, particularly on sunny days. Here’s a little insider secret: you don’t have to actually be staying at the 1 Hotel Brooklyn Bridge to hang out in its picturesque lobby. With lush greenery, cozy couches, and rustic wooden furniture, it’s truly one of my favorite places to spend an afternoon in Brooklyn. There’s also a fab rooftop bar, chic cafe on the ground floor, plus a rooftop pool and restaurant. It’s also walking distance from the Washington Street photo opp in DUMBO I mentioned above, so I recommend making an afternoon of it—and then heading to Shake Shack around the corner.